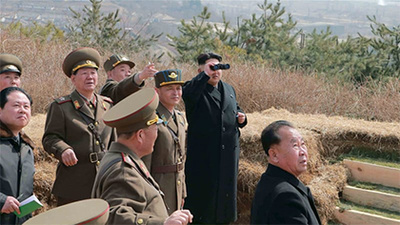 Eureka: Is North Korea bluffing? US-North Korea summit in Q & A format. Question: What's going on in North Korea? How can we view the upcoming summit? Answer: There are two schools of thought in the United States, two schools of thought in South Korea and two schools of thought in North Korea. In the United States you have those who say denuclearization is the goal, and human rights violations are North Korea's private business. That is as long as we can get weapons reductions with North Korea, that's what's important. Another school of thought, one of which the newly National Security Advisor John Bolton is a member is that weapons reductions and human rights' violations both go as a package deal. Otherwise it can be dangerous for the US. Remember with what happened in Tunisia when the French government had very friendly relations with Ben Ali but when the Ben Ali regime was collapsing and horrific accounts were made of human rights violations, the French government almost collapsed. Same thing could happen to the US government in the long run if human rights violations in North Korea are tolerated. In South Korea there are also two schools of thought. One according to which the North Korean government will eventually collapse and Korea will be unified. Another according to which the North Korean government and institutions are there to stay and that South Korea needs to learn to adapt to its Northern neighbors. The first school of thought tends to be very rude to the North Koreans, but rarely threatens to attack them. The other school of thought tends to be more tolerant of North Korea and tends to adopt more polite language when adressing them. Don't forget that politeness is clearly marked in the Korean language, but this doesn't mean Koreans are polite at every occasion. South Korean rudeness is one of my main concerns when it comes to disrupting the summit. North Koreans can read into the rudeness more than the Americans can. Finally, in North Korea there are two schools of thought. One is an ideologic path, the Socialist revolution must continue and Americans must be defeated, the other school of thought being a group secretely hoping that North Korea can open its economy so a group of olligarchs can become very rich. Of course North Koreans tend not to think out loud, so reading their views can be very subtle. Officially they are into state ideology, but they wouldn't mind being the next Vietnam when it comes to the economy, or perhaps the next China. Question: Is North Korea just trying to buy time until it builds nuclear warheads? Answer: My mind is split on this one. Indeed, if North Korea was not trying to buy time, they probably would have held the summit immediately, not some time in May. Let me tell you this story before I move on. I speak 9 languages, etc. etc. and thought Koreans had good intetions when dealing with me. Meetings kept being delayed ad infinitum until I got kicked out of the country. All along they hinted at good intentions and stupid me thought I'd be promoted to a good position. Koreans are set in their own ways, envy the US and its position as world number one and anyone who challenges Korea for the world number one spot. Now realistically, North Korea might have good intentions as well. But they are not shy about trying to humiliate the Americans again. Given my personal experience I don't have a great feeling about the summit. Kim Jung Un is no Sadat, and the North Koreans are not the Egyptians. Final question: So what can we expect from the summit? First, not always obvious to negotiators, expect a gigantic room but a small table and few spaces between negotiators. Koreans like to put people in large rooms because everything you say and every gesture you make is clearly seen, but like negotiators to sit close together to avoid informal consultations during negotiations. That is Koreans like to see and hear everything during meetings. Second, watch out for the North Koreans doing what I like to call a “Rodman.” Former NBA star Dennis Rodman was invited to North Korea, Kim Jung Un was very pleasant with him, but then Rodman left North Korea in disgrace as the local papers pointed out he had been an obnoxious guest who was drinking a little bit too much and who trashed his hotel room. That is you could have a Kim Jung Un who is very pleasant, but then the North Korean press say that Trump was not a terrific guest and the deal should thus be cancelled. Finally, try to tilt the negotiation toward that school of thought who wants to get rid of nukes so they can be rich. They won't ever admit that they want to be rich, so be subtle with them.